We have been dancing together for around 12 years. Cliff started Swing Dance lessons about 16 years ago with his majority of lessons being Savoy Style Lindy Hop with International Dance teachers Graham and Ann from Hoppin Mad. Cliff also has a passion for Collegiate Shag and has been to many lessons and workshops. Erica has spent many years dancing around her handbag, then again about 16 years ago discovered Modern Jive, then followed Jazz Jive, then Lindy Hop and finally Collegiate Shag. Learning from a variety of very talented dance teachers. We met on the dance floor and over the years we have developed our own style which is often commented on with a smile. 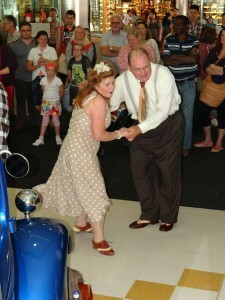 We have brought our own styles and experience together and ended up with quite a characterful style of Swing Dance. As our dance style developed we decided to dance down the aisle in 2011 and so it continues. We dance Lindy Hop most weekends at social dances and events and we have been asked so many times ”are you dance teachers?” that we decided to offer our services. With Erica’s experience and qualifications in teaching and training and Cliff’s knowledge of music and dance moves with think we make a good team. We have performed and taught at various festivals including Retrofestival in Newbury Berks and Vintage Nostalgia in Stockton, Wiltshire, plus lots of local festival and fundraising events. We dance a variety swing dance styles including Lindy Hop, Collegiate Shag and Charleston and love to dance to 20’s, 30’s, 40’s and 50’s swing music.